Police seized more than £500,000 worth of heroin and cocaine during a series of planned drugs raids in Fife. A 26-year-old man from Kirkcaldy is expected to appear at Kirkcaldy Sheriff Court tomorrow (Fri), in connection to the discovery of the class A drugs. Fife Constabulary confirmed it was part of an ongoing intelligence led operation designed to tackle serious organised crime. Detective Superintendent Garry McEwan, head of crime management for Fife, said: “The targeting of those involved in drug dealing and organised crime remains a very high priority for Fife Constabulary. “The misery caused to local communities by this form of criminality cannot be understated, and Fife Constabulary is fully committed to use all available resources to target, disrupt and detect those involved in its supply and distribution as set out in the Force Policing Plan. “Class A drugs cause significant harm within our local communities and it is these communities that I appeal to now. “Contact the police if you have information about those involved in serious crime, including drug dealing and we will react and when possible arrest those criminals involved. “In relation to this particular seizure I would again like to thank our communities for their ongoing support and would urge that members of the public continue to alert us as to their concerns and provide information that would assist us in removing harmful drugs from our streets. A SECURITY guard at Heriot-Watt University who saved a toddler from choking to death on a hot dog has been hailed a hero. Two-year-old Jess Shearer had fallen unconscious at the nursery she attends on the university’s campus in Edinburgh, when Dave Love rushed to the scene and dislodged the piece of food, and managed to resuscitate her before paramedics arrived. Since the ordeal, Mr Love has been honoured with an award from the university’s principal, Professor Steve Chapman, who declared the father-of-two’s actions as “quick, decisive, professional and instinctive”. A MAN who can’t remember how he ended up at hospital told a Polish security guard to “go home” because he woke him up. Security staff were called to the A&E department of Edinburgh Royal Infirmary because Stuart Clarke has been acting aggressively. They arrived to find the 17-year-old fast asleep and woke him up, to be met with a torrent of abuse. A MAN embezzled more than £5,000 from the shop he was in left in charge of by faking cashback transactions. Richard Humphries, 32, put £50 cashback through the company’s system on credit card payments then pocketed the cash to feed his gambling addiction. He managed to steal £5,500 before being caught by an auditor who became suspicious of the assistant manager. HEALTH experts are warning that Edinburgh could be facing a HIV ticking time-bomb, as more than 100 new cases a year are expected over the coming decade. The number of new infections could jump by 10 per cent, bringing the city back up to the shocking levels seen during the 1980s. It is believed the problem is now even worse than when it hit its height 25 years ago, because medical advances mean existing patients are living with the disease for longer. There are 1,100 cases in the NHS Lothian area – with a tenth of these arising in 2010 alone. Treating each patient cost the health service around £10,000, meaning health bosses are looking to source over £1 million each year to cope with the epidemic. THE SCOTTISH Government launched a crackdown on forced marriages today (Thurs) – warning offenders they could be jailed under strict new laws. Deputy First Minister Nicola Sturgeon unveiled the new legislation which gives courts the power to issue Forced Marriage Protection Orders aimed at keeping those most at risk safe and also helping those threatened with being taken abroad against their will. 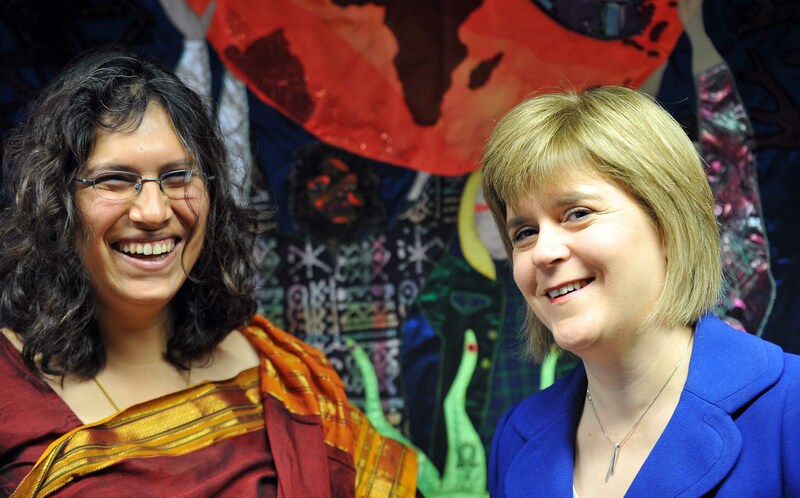 Speaking at Shakti Women’s Aid in Edinburgh, where support workers help young women who experience domestic abuse and provide assistance to those who are being forced into marriage, Ms Sturgeon said: “This is a very important piece of legislation to protect people from being forced into marriages against their will. BOSSES at Edinburgh’s Royal Hospital for Sick Children hope to use ideas from families of loved ones who owe their lives to the miracle staff there to make improvements at the campus. A new family forum has been set up, inviting parents and carers who have spent time at the hospital to contribute their views about what will make the facility better. In a series of regular meetings, starting on Thursday 7 October, parents can voice their opinions to management about ways in which the hospital can be improved with regards to outdoor space, play areas and transport arrangements.